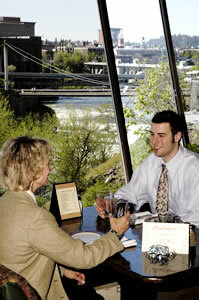 Clinkerdaggers is a landmark restaurant right on the banks of the Spokane River. The fish entrees are so fresh that you will swear they are fishing out the back door of the restaurant, grilling them quickly and rushing the succulent result right to your table ! This upscale eatery in Spokane’s historic turn-of-the-century Flour Mill has been a Spokane favorite since opening in 1971. 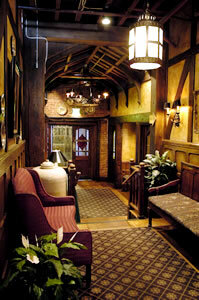 The Old English décor with its dark wood-paneled richness and Edwardian English pub feel is elegant but welcoming. 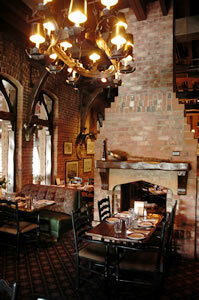 Wintertime fires burn warmly in several fireplaces and summer is celebrated on an outside heated patio stretching right to the river falls. Rock salt-roasted prime rib and fresh salmon fillets are featured entrees that keep customers coming back time after time. 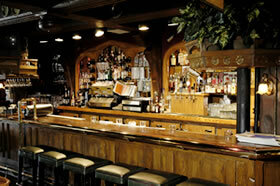 Clinkerdaggers offers a wide variety of American cuisine and is famous for its pea salad and crème brulee desert. Seafood, pastas, and chicken are prepared with taste and style. Lunch features excellent sandwiches, French Onion soup, tasty salads and smaller entree selections. The wait staff knows just how to cater to guests' needs and service is first rate. Whether the river is in spring rush or softly late season flowing, the view from Clinkerdaggers is a Spokane classic. 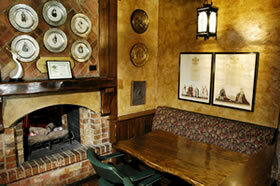 The setting is well matched by the ambiance of the décor and the classic cuisine. Bon Appetite !